To accompany its spectacular exhibition on Steampunk, which closed in February after drawing more than 70,000 visitors in four months, the Museum of the History of Science at Oxford University published a mini-website that continues to provide the perfect introduction to the genre. A well-organized set of links takes you to resources that include informative videos, a virtual tour, and a photo gallery. The exhibition showcased the work of 18 internationally acclaimed Steampunk artists. 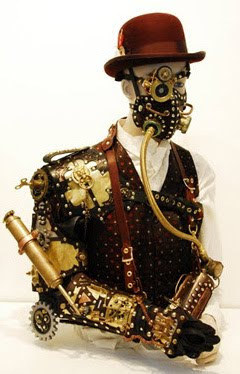 Shown here: a mechanical man by Winchester-based artist Amanda Scrivener. "As her creator persona, Professor Maelstromme, Scrivener crafts items in her laboratory that bring to mind romance by gaslight, arcane science, the steam age, and carnival sideshow curios inspired by aged materials from the tombs of Victorian England," says exhibit curator Art Donovan. "All in all the Professor’s curiosities have been hailed as imaginative oddities epitomizing the rich landscape of Steampunk design." Check out Scrivener's weird and wonderful Etsy store, where she sells clockwork cannibal dolls, razor necklaces, and Steampunk-style top hats festooned with feathers, ribbon, old watch faces, metal stamping, broken spectacles, and keys. In other Steampunk news, Orbit Books, a major fantasy/sci-fi imprint owned by Hachette, has just issued a short video that compresses the process of creating the cover of Blameless, a new novel by Gail Carriger, to just two minutes. The book is the third in Carriger's "Parasol Protectorate Series," comprising "comedies of manners set in Victorian London: full of vampires, dirigibles, and tea" that feature the predicaments and peregrinations of the intrepid Alexia Tarabotti. The first book in the series, the Steampunk-vampire mashup Soulless, will be followed by Changeless on 30 March; Blameless is due to be published in September. Fabulous post! Found the vids really fun. A steampunk / vampire mashup! Now that is of the zeitgeist.